Alaska Magazine Photo Contest Winner ! 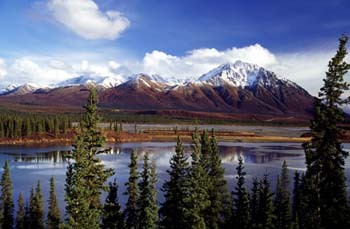 This image won 2nd place in the "scenic" category for Alaska Magazine's 2004 photo competition. It appeared in the September issue. This is a shot of the Clearwater Mountains with the Susitna River in the foreground. Welcome to Knoll-Photo.com ! This opening image from Alaska depicts the kind of subject matter I like to photograph: still, pristene, no traces of man's touch. I also like shots that are representative of man's low's or highs: abandoned dwellings vs. ornate architecture. Well I hope you enjoy it and I also hope you'll visit my store and acquire a fine art photo for your collection.